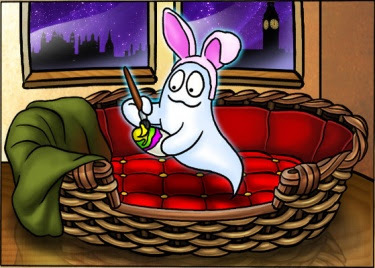 Happy Easter from Theresa's Haunted History of the Tri-State! Be sure to join me over on Facebook for lots of spooky Easter-themed posts all day long. Have a great week, and stay spooky my friends! Chalk this one up to things I laughed at harder than I should have! It actually kind of hits close to home. I've never had a fear of ghosts, thank goodness, but as long time readers to Theresa's Haunted History blog and Facebook probably know, I've struggled with depression my entire adult life. It isn't always easy finding mental health professionals with an open enough mind to NOT diagnose you schizoaffective when you tell them that you investigate and research ghosts for a living. But yeah, sorry for the F-Bomb in this one...it was just too funny not to pass up, lol. Have a spooky weekend ya'll! 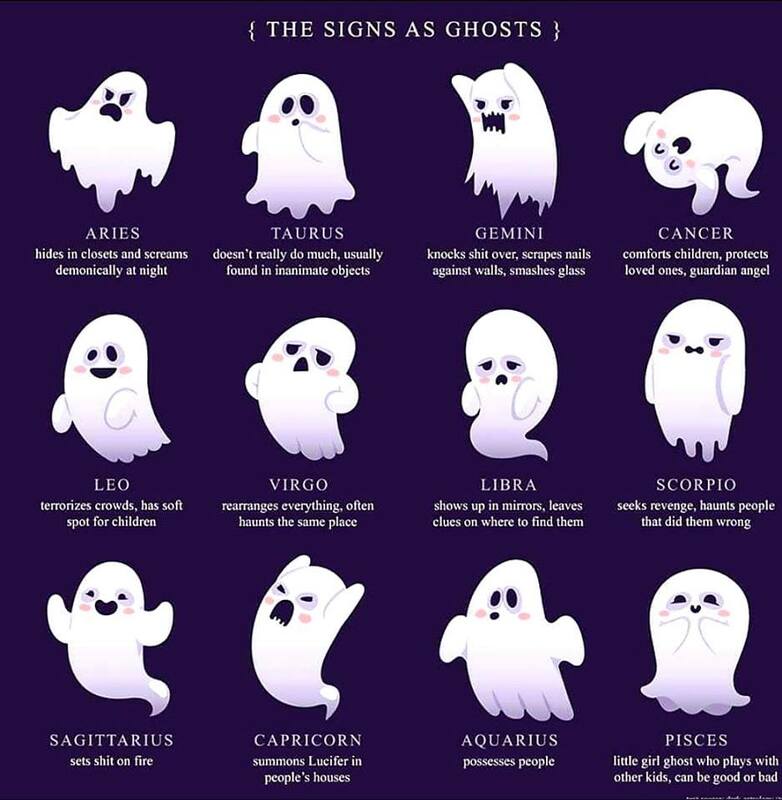 So, what's your sign? I'm a Sagittarius, but I er, uh, do NOT set things on fire, lol. I'm not a pyromaniac in life, so I'm guessing I wouldn't magically become one after I die. However, I guess I shouldn't rule anything out, right? Let me know in the comments below what YOUR sign is...and whether or not the description fits YOU! 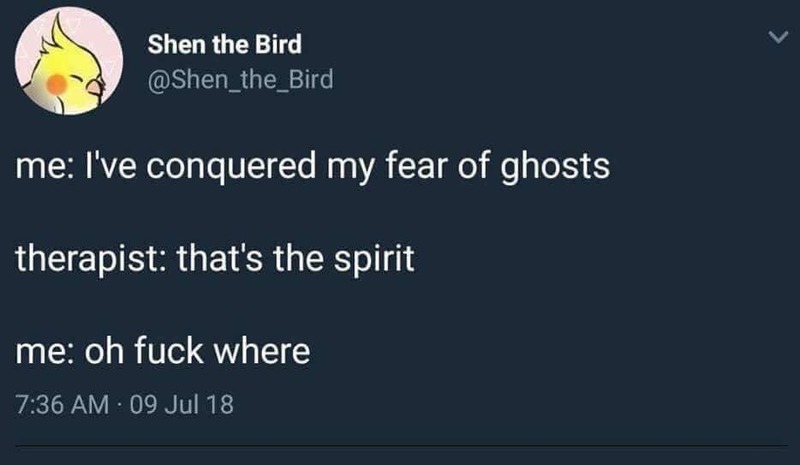 Have a fun weekend, and stay spooky everyone. So, this meme is supposed to be funny, but it does highlight an important aspect of paranormal investigation: You don't NEED to spend thousands of dollars on equipment....especially when you're first starting out! My very first 'ghost hunting kit' contained a 35mm camera (often supplemented by one of those old disposable cameras), a flashlight, a notebook and pencil, a microcassette recorder that I borrowed from my mom's office, and a cheap compass. As time went on, I upgraded quite a bit, but to this day, I still haven't really broke the bank on equipment. It can be fun trying out the latest gadgets featured on your favorite ghost hunting shows, but the truth is, most of that stuff is not really scientifically proven to be able to detect ghosts! If you're just starting out, I highly suggest you hold off on making any huge purchases for awhile. Look around your own house and see what you already have that can be used on an investigation. Most people either own or have access to basic stuff such as flashlights, video and still cameras, voice recorders, temperature recording devices, and basic means of taking notes. And although I don't normally recommend using a smart phone for investigation purposes, in a pinch they provide access to everything I've listed above, plus a myriad of apps that some ghost hunters swear by. 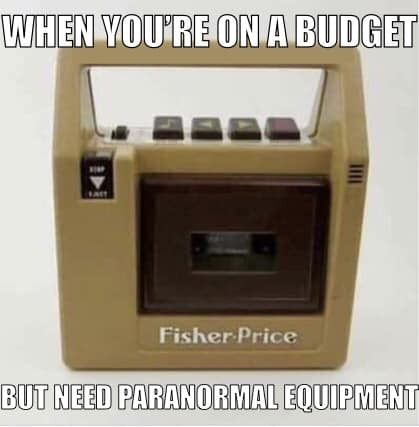 If you decide that paranormal investigation/ghost hunting is a hobby you'd like to pursue further, THEN start thinking about investing in some higher quality, more specialized equipment. However, DO YOUR RESEARCH! Don't waste your time or money on fun, flashy gadgets that aren't really of any scientific merit, just because you saw someone else use them. Be wary of equipment that is specifically marketed towards ghost hunters. This is for two reasons: 1. As I've said before, there is no way to prove ghosts exists, so its only conjecture at best that these devices can actually detect ghosts. And, 2. These devices are usually going to be more expensive. In the case things like cameras and EMF detectors, shop around to see if you can find the same or similar device, NOT being marketed to the paranormal community, for less. Also important to note...make sure you know how to use any equipment you might acquire. Equipment is only as good as the person interpreting its data, so train yourself on how to use your stuff properly. Know its limitations and potential issues. Finally, take care of your stuff---you're paying for it, so make sure you keep it in good working order. And, just a quick bonus tip: People tend to want to start out in this field by buying a ton of really cool equipment. Unfortunately, many quickly lose interest in paranormal investigation and end up selling off their stuff for much less than what they paid for it. Or, as they find that they enjoy the field and want to go further, they upgrade their equipment and sell off their older stuff. Shop around. Take a look at places such as eBay and Amazon to try to find the best deals on gently used equipment! Someone Like Me: A Friday Funny! Aww, I love this lil' cartoon by Matt Tarpley! I'm sure most of us with an interest in the paranormal field have, at one time or another, felt like we'd never find someone spooky like us to share our passion with! Plus, there's bunnies, making this the perfect Easter-month Friday Night Funny! Have a fun and spooky weekend everyone! 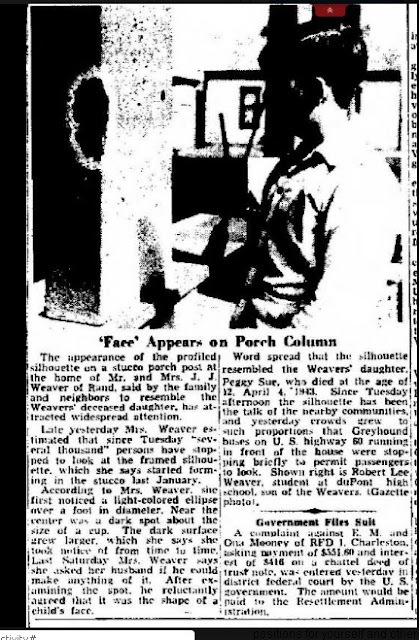 The appearance of the profiled silhouette on a stucco porch post at the home of Mr. and Mrs. J.J. Weaver of Rand, said by the family and neighbors to resemble the Weavers' deceased daughter, has attracted widespread attention. Late yesterday, Mrs. Weaver estimated that since Tuesday, several thousand persons have stopped to look at the framed silhouette, which she says started forming in the stucco last January. According to Mrs. Weaver, she first noticed a light-colored ellipse over a foot in diameter. Near the center was a dark spot about the size of a cup. The dark surface grew larger, which she says she took notice of from time to time. Last Saturday Mrs. Weaver says she asked her husband if he could make anything of it. After examining the spot, he reluctantly agreed that it was the shape of a child's face. Word spread that the silhouette resembled the Weavers' daughter, Peggy Sue, who died at the age of 12, April 4, 1943. Since Tuesday afternoon the silhouette has been the talk of the nearby communities, and yesterday crowds grew to such proportions that Greyhound buses on U.S. Highway 60 running in front of the house were stopping briefly to permit passengers to look. Shown right is Robert Lee Weaver, student at DuPont High School, son of the Weavers. [Gazette photo]. Along Capitol Street in Charleston, WV there sits a mysterious little man. Every day, people walk right past the Mortar Man, never even noticing he's there. But, to those who DO know where to look, Mortar Man has become a local celebrity....and a local legend. For years, mystery shrouded the tiny figure. 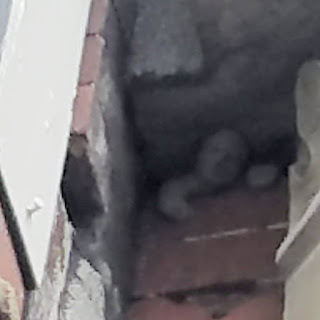 Located 12 feet above the ground, tucked into a corner of brick between two buildings, and measuring in at only 2 inches by 4 inches, its no wonder that so many people never noticed the Mortar Man. For those who did know of the tiny little figure, now referred to as West Virginia's smallest piece of public art, stories abounded as to how the figure got there, who created him, and of course...WHY. Was Mortar Man some sort of protector or guardian? Was he a supernatural creature? Or was he just someone's idea of a joke? Turns out, the Mortar Man is the creation of local sculptor, P. Joseph Mullins, best known for work on the Veterans Memorial at the State Capitol Complex. 30 years ago, Mullins was working on the facade of a historic building. During a lunch break, he took some leftover building materials and sculpted the little fella. Apparently it took three years before a police officer noticed the figure and people started wondering what the heck was going on! Over the years, Mortar Man has become a favorite with both locals and tourists who have heard of the strange little figure. 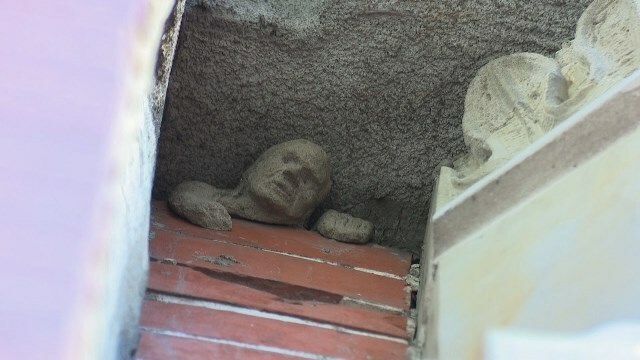 When renovations to the building led to the removal of Mortar Man, people threw such a fit that he was replaced. At one point, someone even tried to steal him! Luckily, Mortar Man is still holding his ground on Capitol Street. Go to #108 Capitol Street. To the left of the building, between its facade and the neighboring building, look straight up about 12 feet. He's hard to see, but if you're lucky, you'll catch a glimpse of this magical little piece of art history, right here in the Mountain State! April Updates at Theresa's Haunted History!